Looking for a special feature for your garden? We can fix you up at Barnes Greenhouses! 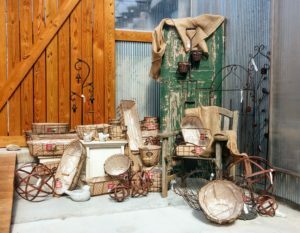 We carry an assortment of metal decor including plant stands, benches, garden stakes, balances, spinners and trellises. Our display of garden flags contains stands, poles and flags in seasonal and gardening themes. 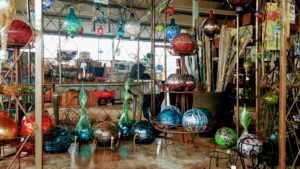 We have a special gazebo area just for our gazing balls and glass garden art. 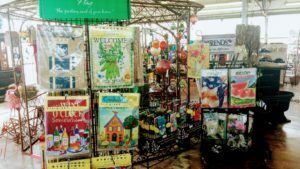 If you are interested in miniature or Fairy Gardens, we have a nice variety of houses, fairies and accessories for these magical gardens. This Barnes Greenhouses staple has become a favorite of many customers. 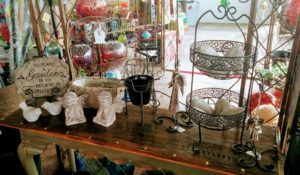 Our garden accent items make wonderful gifts for yourself or a special friend. Don’t forget us for wedding, housewarming, or hostess gifts. Many customers like to purchase garden decor as memorials for families after a loved one has passed. No matter the occasion, a gift from Barnes Greenhouses is a sure to bring a smile!